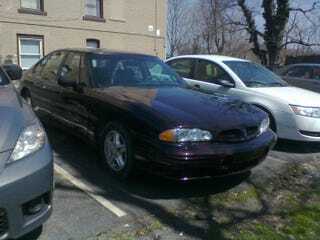 This was the first car I purchased with my own money, a 1997 Pontiac Bonneville SSEi with about 140,000 miles on it. I bought it for $2000 off a guy out in Western Pennsylvania who bought it at a salvage auction and rebuilt the front end for his dad. He sold the car after his father passed away, and to be honest the only reason I considered the purchase was because he gave it to his *father*. Otherwise, I probably would have run away, and fast. I bought it with the check engine light on, but that was fixed with $25 of junkyard parts and a code scanner. Other than that, it was perfectly reliable mechanically...the problem was the light fixtures and trim pieces in the front of the car that were never quite right after its accident, and either bound or fell off. A parking light fell out of its housing and rubbed the insulation of the wiring, causing me to lose every light in the car except headlights while driving down the highway outside of Altoona at around 9pm. Good times. I traded it in against my WRX for $500 after owning it for about a year. Considering the number of times I drove it from Detroit to Pittsburgh and Pittsburgh to Boston, I probably put 15,000 miles on the car.